You may import wipe lists specified in the .ini file format using the Import from .INI button. 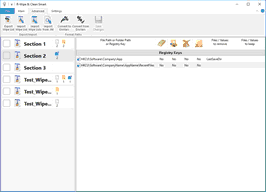 You may use this file format to create wipe lists manually. Each key name in the section must have a unique name, otherwise the entire section will be skipped. A full path to a file. The file will be removed. A full path to a folder followed by a vertical bar and .and a list of file names and/or file masks separated by semicolons. The files in that particular folder matching to the file lists and file masks will be removed. The folder and its content will be removed, but its sub-folders will remain. The Registry key will be deleted. 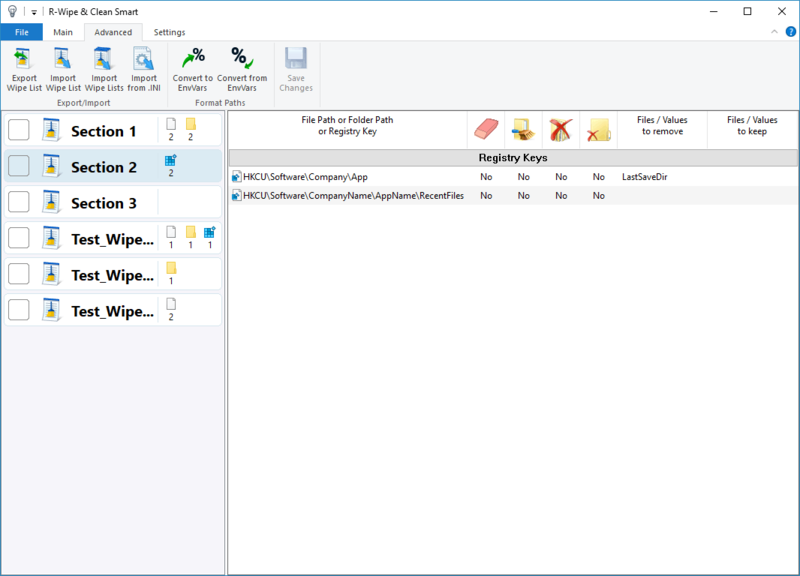 A full path to the Registry key followed the a vertical bar and value name(s). That particular value of the Registry key will be deleted. The file will be excluded from removal. The files in that particular folder matching to the file lists and file masks will be excluded from removal. The %LocalAppData% environment variable is used to specify the path to the Activity.log file. Files with the log and cache extensions in the D:\My Docs\Errors folder will be removed. The content of the %LocalAppData%\CompanyName\AppName\Logs folder will be removed, but its sub-folders will remain. The path to the folder contains the %LocalAppData% environment variable. The entire HKCU\Software\CompanyName\AppName\RecentFiles Registry key will be deleted. The LastSaveDir value will be removed from the HKCU\Software\Company\App Registry key. The Error.log file in the %LocalAppData%\Company\Product\Logs folder will not be removed. The path to the folder contains the %LocalAppData% environment variable. Files with the receipt and report extensions in the D:\My Docs\Manage folder will not be removed. Some import actions require more complex settings. Those settings are specified on the INI Import Settings dialog box on the Settings menu. Those settings can be saved and loaded later. • Specify a parameter in the Parameter for Recursive Subfolder Cleaning field on the INI Import Settings dialog box. In our example, it is CleanItself . All files with the log extension in the D:\My Docs\ folder will be removed, and all its subfolders will be removed, too. The content of the %LocalAppData%\CompanyName\AppName\Logs folder will be removed, together with all subfolders. • Specify a parameter in the Parameter for Removing Folder after Cleaning field on the INI Import Settings dialog box. In our example, it is CleanItself . The %LocalAppData%\CompanyName\AppName\Logs folder will be removed, with all its content. 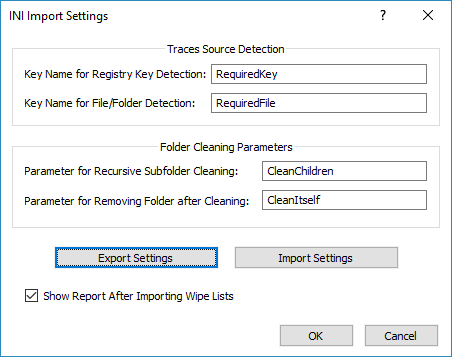 It can be done by specifying Key Name for Registry Key Detection and Key Name for File/Folder Detection parameters on the INI Import Settings dialog box. In our case, they are RequiredKey and RequiredFile . Section 1 will be imported, while Section 2 will not. Section 3 will be imported, while Section 4 will not. • Click the Import from INI file button and select the required file. 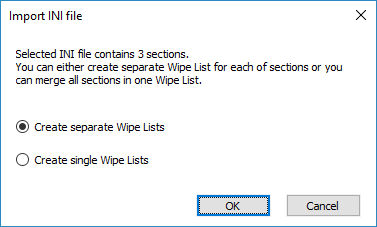 You may import the entire INI file as a single wipe list or each section as a separate wipe list. The resulting wipe list(s) will appear on the list of wipe lists.